The extraordinary life of Helen Hester Buie Elliott began on December 11, 1916, in Bladenboro, NC. A strong Christian and a devoted mother, grandmother, aunt and friend, she left this earthly life on December 2, 2018, for her heavenly home, where she will have a glorious reunion with loved ones who have gone before her. Helen packed lots of experiences, adventures and travels into her nearly 102 years. After graduating from high school, where she was valedictorian, and from Pineland Community College, she went to work. Over the next 50 years, her jobs included serving as secretary to U.S. Senator Eugene Milliken of Colorado in Washington, DC, bookkeeper for Bridger Corp. in Bladenboro, NC, secretary to U.S. District Court Judge Harold Ryan in Boise, ID, manager of the Weiser (ID) Chamber of Commerce, co-founder of the National Oldtime Fiddlers’ Contest, and operator of a whitewater rafting company on the Snake River in the Pacific Northwest. She was a bright and gifted lady who excelled at any challenge. Helen loved people and loved to serve them. After returning to North Carolina in the late 1980s, she became a vital part of her beloved Immanuel Baptist Church in Fayetteville. There, she enjoyed teaching Sunday School, visiting shut-ins, singing in the choir and serving on the kitchen committee and in any other capacity where she was needed. Helen was most passionate about studying the Bible and never wavered in her desire to grow closer to God. 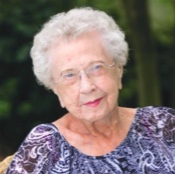 Other passions included cooking for her family and friends, reading, creating beautiful needlework, staying active and living life to the fullest. She especially loved and cherished her great-niece Suzanne Dudley of Fayetteville (husband Bill) with whom she lived for the past 15 years; her great-great-nieces and -nephews Ruby, Celia, Si and Wheeler Dudley; her niece Ruth Ellen Robertson; and her dear friend Gaynelle West. They all meant so much to her. She is survived by her son, William Buie (wife Jean) of Boise, ID; grandsons Mark Buie (Evonne) of Rio Rancho, NM, Matt Buie (Kim) of Meridian, ID, John Buie (Linda) of Apex, NC, and Thomas Buie, III of Greensboro, NC; and granddaughters Jeanette Buie of Boise, ID; Kristine Buie of Denver, CO, and Diana Buie of Hickory, NC; great-grandchildren Noelle Hawkins (Joseph), Clay Buie and Marshall Buie, all of Meridian, ID; and a host of devoted nieces, nephews and friends. She is preceded in death by her son, Dr. Thomas E. Buie, Jr.; Thomas E. Buie, Sr. (husband); Blaine Stubblefield (husband); Oscar Elliott (husband); brothers Forbes, Bill, Henry, Jack, James, and Worth Hester; beloved sister Vada Hester Scott; niece Joyce Hester Rogers; parents Elizabeth Penny and William Wade Hester; and great-great-nephew Daniel Wheeler Dudley. A celebration of life is planned for 12:00 p.m. on Wednesday, Dec. 5th, at Jernigan-Warren Funeral Home. Friends will be received prior to the service from 11:00 a.m. - 12:00 p.m. with interment immediately following the service at Pinecrest Cemetery in Bladenboro, NC. In lieu of flowers, donations may be made to Immanuel Baptist Church, 219 Hull Rd, Fayetteville, NC 28303. Helen’s faith in Christ has been steadfast and enduring. She knows the truth of God’s Word that says, “Jesus Christ is the same yesterday, today and forever” (Hebrews 13:8). He has been at the heart of her life, her hope, and her joy for over 100 years.